Ivan was born in Shoreham-by-Sea in Sussex in 1958 and moved to the Isle of Wight in 1964 when the fledgling Britten-Norman aircraft company engaged the services of his father, Denis, as a designer on the proposed BN-2 Islander. By his own admission not especially gifted in academic subjects, Ivan passed through schooling without incident or injury (although he hated every moment of it and couldn't leave soon enough), emerging from high school in 1974 with modest exam results in all but art and English - subjects in which he excelled and has subsequently put to good use. Working as a professional photographer for the next six years proved a useful training ground for his future career in art, but painting for a living occupied just a third of his time during the 1980s, the other two thirds being made up of starting a family and pursuing his musical aspirations - playing drums or guitar in a succession of rock bands with varying degrees of success. Even today, Ivan says that he would be hard pressed to choose between music and art if he were to have his time all over again and still enjoys writing and recording the odd song whenever he has the free time. Having retired from live performances in 1987, he was persuaded to do two shows to help raise money for a charity in 2009, both of which were highly successful but were, in his own words, "The scariest thing I have ever done". No further such performances are planned. Having sold his first paintings in 1978, Ivan recognised the potential in his abilities and his fondness for - and knowledge of - all things aviation meant that all of his early works were of aircraft. Many of his father's contacts were impressed enough by these early paintings to commission pictures from him and he was soon on his way to a full time career in art. In time, various publishers began to produce his paintings in the form of greeting cards, calendars and limited edition prints and many have been used in books and magazines all over the world, whilst his original paintings hang in private collections from the UK to Papua New Guinea and from North America to Hong Kong... and just about everywhere in between! Ivan's studio is now based in Wootton Bridge on the Isle of Wight and, whilst not strictly open to the public, he is quite happy to receive visitors by prior appointment and is always happy to chat with anyone thinking of commissioning a painting of their own. Today, he is still very busy with private commissioned works and paintings for his military publisher, Cranston Fine Arts, but now divides his time between the military stuff and a range of other subjects to add to his broad portfolio and to "maintain sanity". 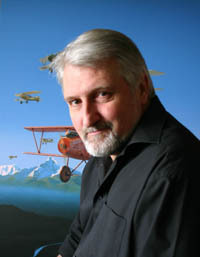 In 2013, Ivan lent his support to the restoration of the oldest surviving Britten-Norman Islander, G-AVCN and, with the help of the British Aircraft Preservation Council, subsequently launched a scheme to help museums and preservation projects throughout the UK to raise money through his artwork. The same year, Ivan was commissioned to research and write a book about the life of Austro-Hungarian WW1 ace Hauptmann Godwin von Brumowski and his part in the war on the Italian Front. Many of Ivan's paintings were used to illustrate the book and gave him an opportunity to demonstrate his writing skills. To see Ivan talking about his life and work, go to the short video on this website.